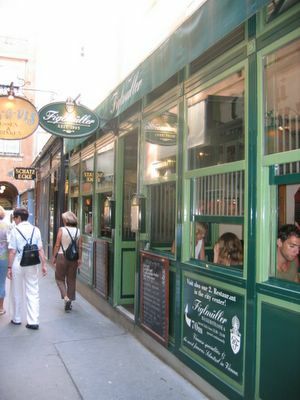 Prior to arriving in Vienna, I was using the internet at my Berlin hostel and chatting to my mate Timmy K. He'd visited Vienna the year before with his folks, and recommended that I try this restaurant, "Figlmollen?.... Figl-something... well it was good. Best Wiener schnitzel I've ever had. The lamb is also A++!" Timmy K knows his food, so once we got to Vienna, I was very keen to follow his recommendation. However, with his vague instructions, I wasn't sure if I'd even be able to find it. So imagine my delight when we stumbled across Figelmüller during a big day of shopping, just off the main shopping street. Figelmüller is extremely famous for its fab Wiener schnitzel, and since its inception in 1905, a couple more branches have opened up across town. The addresses are all at the website below. 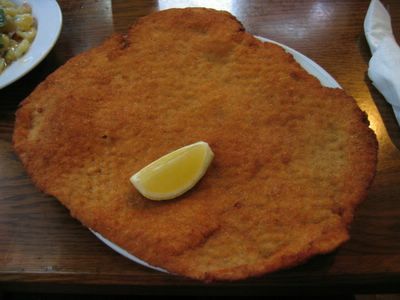 Here is their famous (and enormous) schnitzel. 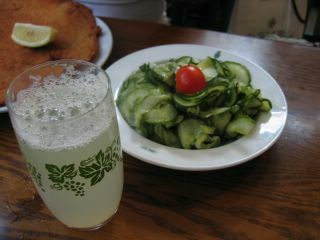 We ordered 2 Wiener schnitzel, a potato salad (the recommended accompaniment), and a cucumber salad. Timmy K was right, the schnitzel was awesome. 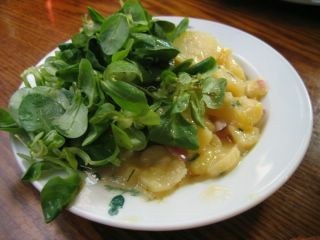 It's pounded super-thin, and lovely and crisp. There are other items on the menu, but I don't see why you'd ever want to go past the schnitzel! Clarice: Between mouthfuls...I love your friend Timmy K! Did you manage to visit Julius Meinl shop on Graben? Or any of the cafes? I took my friends to Demel coffeehouse (lovely, it was suggested by Mannix after all! ), and they have been going back to the place every time they are in Vienna and several times during each of their stay! Ange - I managed about 85% of it before I gave up. Clarice, on the other hand, was more persistent than I and managed the whole thing. Redhead - We didn't go to Julius Meinl, but we did try a LOT of teahouses, including the fabulous Demel. Mmm... sugar!